Shuttle mission STS-62 was a two-week flight of Columbia with packages of microgravity research experiments housed on pallets in the payload bay. The crew narrates the highlights in this film. An air-launched Pegasus rocket lofts NASA's AIM satellite into orbit to study mysterious clouds at the edge of space. NASA's twin STEREO spacecraft have made the first three-dimensional images of the Sun. Scientists unveil the images in this news conference held April 23. The Hubble Space Telescope was launched in April 1990, opening a new window on the universe that has revolutionized our understanding of the cosmos. NASA's Mars Exploration Rover Spirit has discovered evidence of an ancient volcanic explosion at "Home Plate," a plateau of layered bedrock approximately 2 meters (6 feet) high within the "Inner Basin" of Columbia Hills, at the rover's landing site in Gusev Crater. This is the first explosive volcanic deposit identified with a high degree of confidence by Spirit or its twin, Opportunity. There is strong evidence that those layers are from a volcanic explosion, said Steve Squyres of Cornell University, Ithaca, N.Y. Squyres is principal investigator for the rovers' science instruments. The findings about volcanic activity are reported in a paper published in the May 4 issue of the journal Science. Evidence shows the area near Home Plate is dominated by basaltic rocks. "When basalt erupts, it often does so as very fluid lava, rather than erupting explosively," Squyres said. "One way for basaltic lava to cause an explosion is for it to come into contact with water - it's the pressure from the steam that causes it to go boom." Scientists suspect that the explosion that formed Home Plate may have been caused by an interaction of basaltic lava and water. 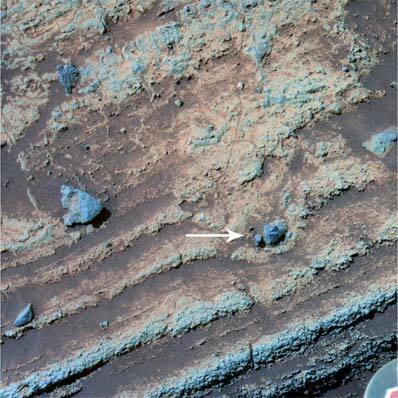 "When you look at composition of the rocks in detail, there are hints that water may have been involved," Squyres said. One example is the high chlorine content of the rocks, which might indicate that basalt had come into contact with a brine. One of the strongest pieces of evidence for an explosive origin for Home Plate is a "bomb sag" preserved in layered rocks on the lower slopes of the plateau. Bomb sags form in volcanic explosions on Earth when rocks ejected skyward by the explosion fall into soft deposits, deforming them as they land. 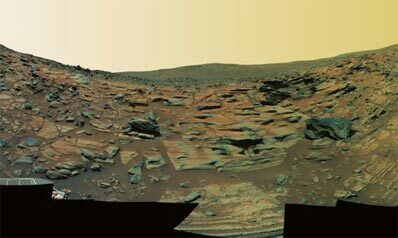 Spirit arrived at Home Plate in February 2006 and spent several months exploring it in detail before driving to "Low Ridge" to pass the Martian winter. Spirit has now returned to Home Plate to continue exploration there. "We decided to go back to Home Plate, once the Martian winter ended, because it is one of the most interesting places that we've found on Gusev Crater," Squyres said. "Last year we primarily explored the northern and eastern sides of it. This time we're hoping to get to the southern and western sides." Spirit's continued exploration of Home Plate will focus largely on testing the idea that water was involved in its formation process. Spirit and Opportunity are in their fourth year of exploring Mars. They successfully completed their three-month prime missions in April 2004, and the missions have been extended four times. As of April 26, Spirit had spent 1,177 sols, or Martian days, on the surface of Mars and had driven 7,095 meters (4.4 miles), and Opportunity had spent 1,157 sols and driven 10,509 meters (6.5 miles). "Considering their age, both rovers are in good health. All science instruments are functioning and continuing to return superb science data," said John Callas, project manager of the Mars Exploration Rover mission at NASA's Jet Propulsion Laboratory, Pasadena, Calif.
JPL manages the Mars Exploration Rover project for NASA's Science Mission Directorate. JPL is a division of the California Institute of Technology in Pasadena.